Wine of Greece. Sweet red wine. Cameo - Red Greek Wine Mavrodaphne meaning ""black laurel"" is a wine of world renown coming from Greece. It has a powerful bouquet full of raisins and dates. On the palate dried fruit flavours develop followed by good acidity which gives terrific support and backbone to this excellent wine. The fruit-driven finish possesses wonderful length. Wine of Greece. Sweet red wine. 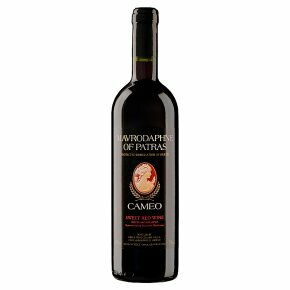 Cameo - Red Greek Wine Mavrodaphne meaning "black laurel" is a wine of world renown coming from Greece. It has a powerful bouquet full of raisins and dates. On the palate dried fruit flavours develop followed by good acidity which gives terrific support and backbone to this excellent wine. The fruit-driven finish possesses wonderful length. The wine is very versatile. It is delicious with cheese or fruit. It is one of the few wines to go well with chocolate flavours. Try it with a slice of lemon as a refreshing aperitif or as an accompaniment to a hearty meal such as a stew or with game. It is recommended to be served chilled.